During our first meetings, we will listen as you describe your new home - beginning with budgetary considerations, exterior appearance, number of rooms and their sizes, amenities that you would like, types of cabinets, floor coverings and many other additional items that need to be considered. Based on what you tell us, we may be able to select from our files those floor plans that approximate your description. An existing home plan is an ideal place to begin, It may be necessary to alter the original design or combine several plans and, if necessary, create a plan from your imagination, whichever way, we will work with the most appropriate method to suit your needs. This also is a good time to to do a quick feasibility study to determine if your budget is adequate to meet your expectations. As these preliminary plans develop, we get closer and closer to seeing your home on paper. Once we have the preliminary plans on paper, you will be able to get some preliminary estimates to be sure that you are still within your targeted budget. 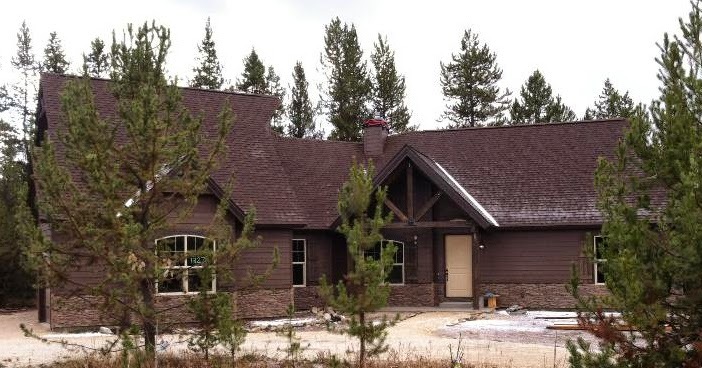 When you feel comfortable with your preliminary costs we can then finish the detailed working set of plans from which you will be able to get firm bids. One of the maddening and frustrating aspects of having a custom home designed and built is not knowing exactly what it will cost until all of your choices have been made. 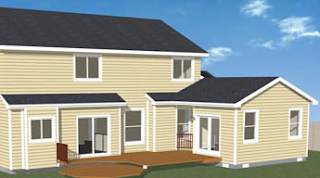 Each change, adjustment, addition or deletion in the design affects the cost of the home. Until all decisions have been finalized, nobody will know the exact cost of the home. Some of the steps listed below for remodels/additions are also applicable to designing plans for your new home as well. Using our extensive design expertise and the 3D CAD program called Chief Architect we’ll produce detailed As-Built drawings of your existing house. Then working together we’ll go through a process that distills your wants and needs into a design that fulfills those requirements. All the while we’ll work hard to keep your budget in mind so the designs we come up with can become reality. During this process we’ll work closely with you to find out what your goals for the project include. Upon completion of the As-Built drawing, we’ll meet to discuss how to proceed. We’ll ask lots of questions, record your answers and then apply what we've learned to your project. The more information you can supply will save time, save money, and will help clarify for us what your goals are. • Written lists of your needs and wants as well as what you don’t want. • Gather a scrapbook of notes, photos, and articles that you have collected. • Get together with your family and ask them for their input and wish lists. • Come up with a budget you can live with. • Lists of web sites with comments about what you like and don’t like. • Descriptions of items in your home that you want to include in the design i.e. kitchen appliances, furniture, cabinets, etc. • Pictures of other houses with notes describing what you like. • Any other information about the project. • Go to www.getdecorating.com for thousands of project pictures (membership fee required). Creating the As-Built Drawings An important part of the process requires accurate drawings of your existing home. These are referred to as the As-Built drawings. 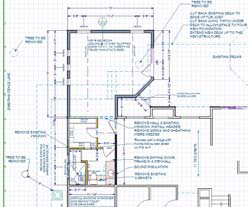 We put a lot of emphasis on creating very accurate As-Built drawings and will spend the time necessary to get all of the information needed on the affected areas of your house. We will agree on a time that works for you and will arrive at your home with a laptop to setup and draw the existing structure on-site. Rather than risk missing anything by taking notes and drawing the structure at our office, we’ll take the time needed on-site to get everything needed. When the As-Built Plan is finished, we’ll have an accurate plan to work from. We’ll also take lots of digital photos of your house so that questions that may arise during the design process can be answered by referring to the pictures. Initial Design Concepts Once the As-Built drawing is complete, we will meet to discuss the project in more detail. We will ask questions and review the information that you have gathered about your project. Armed with this information, we’ll produce some preliminary designs focusing on form and function as we apply your input to the drawing. During this process we will send you layouts of the project as well as 3D Renderings for your review. Once we have enough to show you, we will either meet again or we’ll do an online conference to go over the concepts. If we've managed to capture what you want in the concepts, we’ll move to the next step. If not, we’ll work on more concepts until we arrive at a plan that works for you. Refining the Plan With a firm understanding of the concepts, the next step is to start adding more detail to the plan. At this point, we’ll add more accurate textures, windows, doors, etc. to the plan. It may also be beneficial to work together on the plan to make changes and discuss the details that are added. You can be a part of the design process if you desire. We’ll continue to move through this stage of the process until we both agree that the plan is coming together with the ideas that work for you. The Working Drawings Once the plan is at a point where it works for you, we will proceed to detailing it for the working drawings. We will create the framing sections; add notes, dimensions, call-outs, and everything else that will be required for the building contractor and to obtain permits. During this process we may consult with your contractor to discuss the building methods that they prefer. We may also work with your interior designer or kitchen and bath designers to get their input to detail the plan to their specifications. Upon completion of the working drawings, we will send a PDF file of the plan to you and to a print shop like Kinko’s. They will produce the plan sets that you need for the project. • Items in a plan that need to be engineered. • Any soil exploration or soil analysis needed. • If a survey is needed and a current survey cannot be found, you will be responsible to hire a surveyor. • Any outside designers or interior decorators that become involved in the process. • Costs for any prints needed. • Final detailing of cabinets is usually completed by the cabinet supplier. • Detailed specifications. This is generally done by the contractor (which could be us!). The design process can vary greatly depending on the type of project. Generally we can give you a range of costs involved in the designing the project. The range is affected mainly by the number of meetings we have and how many changes are made. A well thought out, detailed plan will save you a lot of money and aggravation when it comes time for the contractor to do the work. It becomes the most important form of communication you will have. You’ll have fewer delays, changes and cost overruns because everyone knows what to expect in advance.